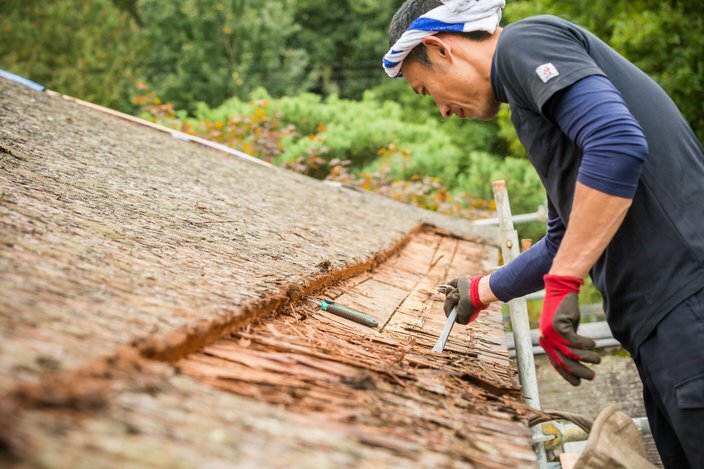 Norihiro Kawada is one of two Japanese artisans from the Tanigami Roofing Co. that have come to Philadelphia to make repairs on the roof of the Shofuso Japanese House and Garden in Fairmount Park. 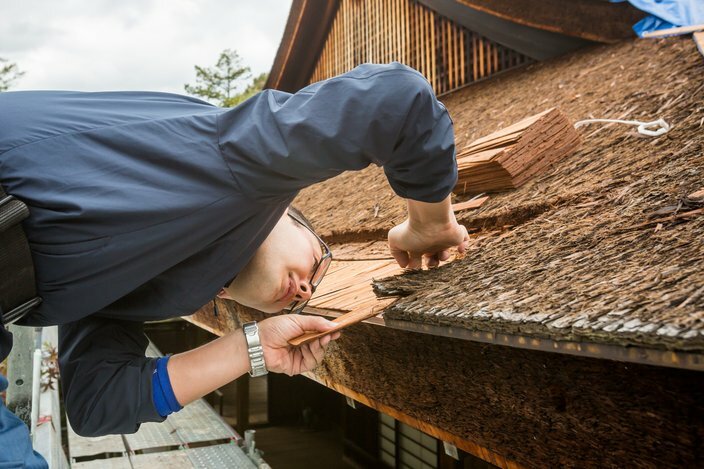 Only 100 people in the world are skilled to build or repair traditional Hinoki roofs. 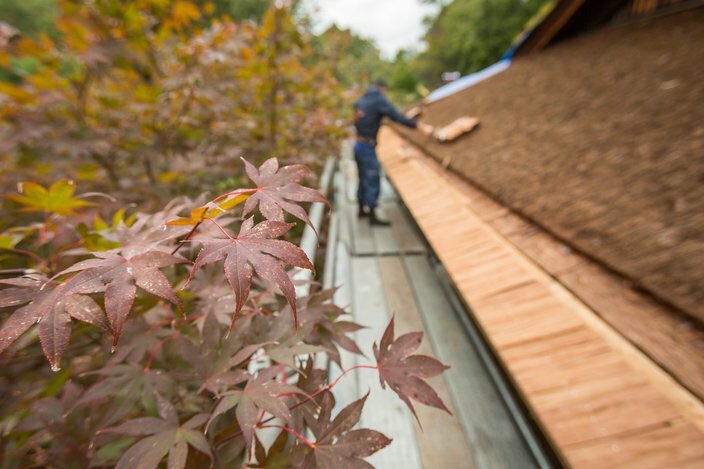 Using some of the finest building sourced from the Imperial forests of Japan, two artisans have come to Philadelphia to repair the roof on the traditional Shofuso Japanese House and Garden in Fairmount Park. These gentlemen are two of only 100 in the world that have learned the skills to do this type of work. 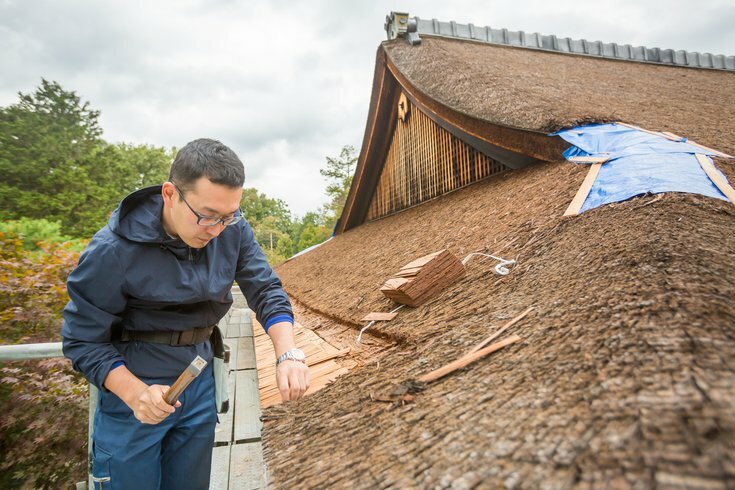 Starting now, they will spend two weeks meticulously placing hundreds – maybe thousands of pieces of imperial Hinoki bark – by hand, along two perpendicular edges of the roof. 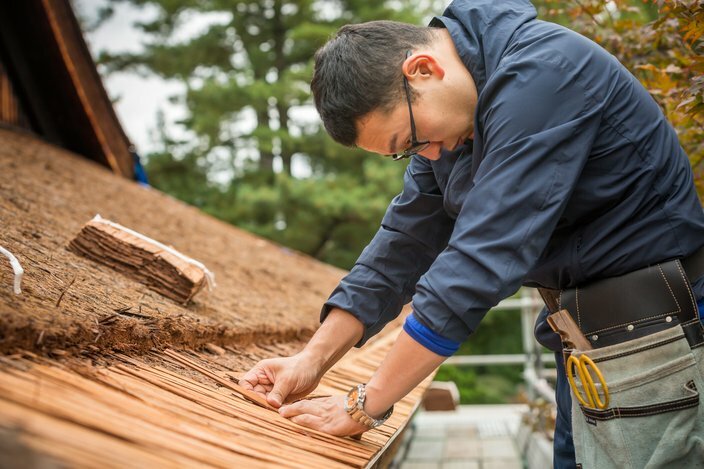 Norihiro Kawada and Ken Ichiwara of Tanigami Roofing Co. LLC, in Nara, Japan brought with them a few simple tools and many kilos of Hinoki bark to do the job. Scaffolding is in place and visitors are invited to tour the restoration areas at 12 p.m. and 3 p.m. during regular admission hours to see the traditional methods used. Tickets can be purchased in advance on Shofuso's website. Below is a series of photos that show how the process works. 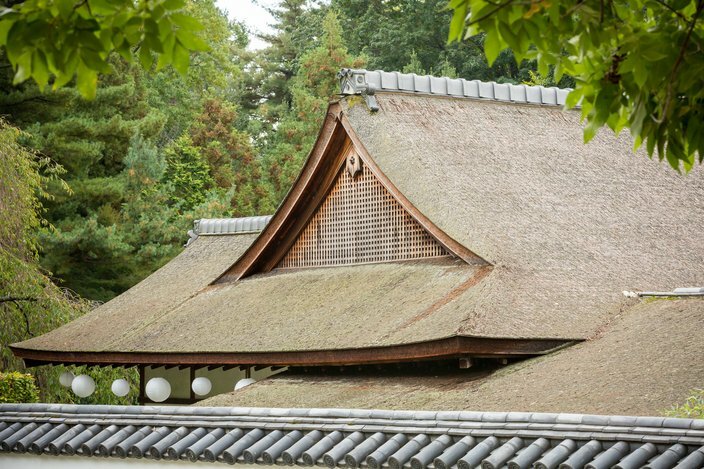 The historic Shofuso Japanese House and Garden in Fairmount Park is in need of some restoration, specifically to parts of the traditional-style “Hinoki' roof. Two Japanese artisans from Nara, Japan will spend 2 weeks making the repairs. It is predicted that the entire roof will need to be replaced in 2035. 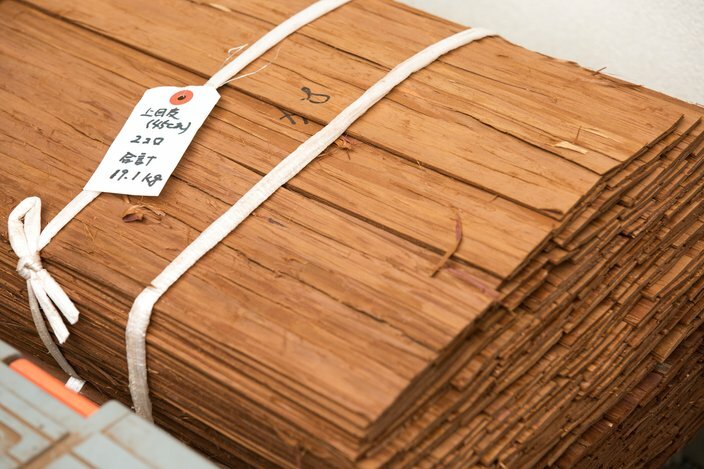 The Hinoki bark used in the construction and repairs is said to be one of the finest building materials in Japan. It is harvested from living Cypress trees, with permission from the emperor of Japan, from the imperial forests. This is 19.1kg of Imperial Hinoki bark. This process is sustainable and does not kill the trees. 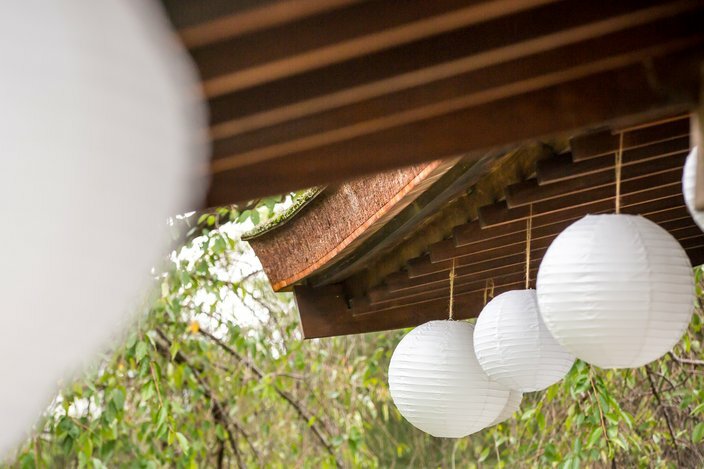 The bottom-edge of the Hinoki roof is much thicker than the at the top of the roof. 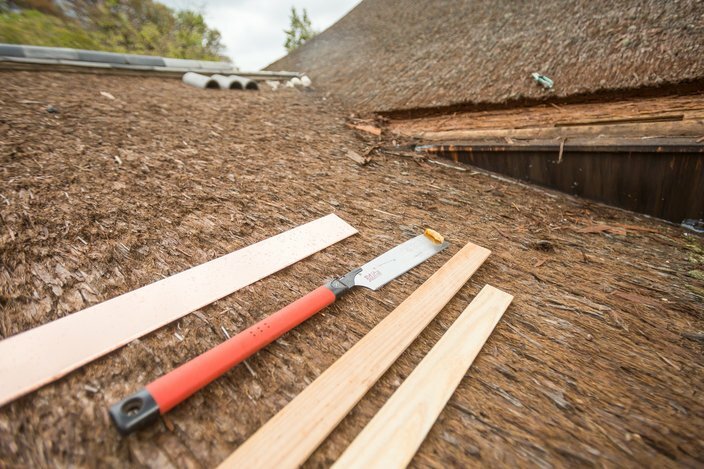 This helps create the traditionally-curved shape of the roof. 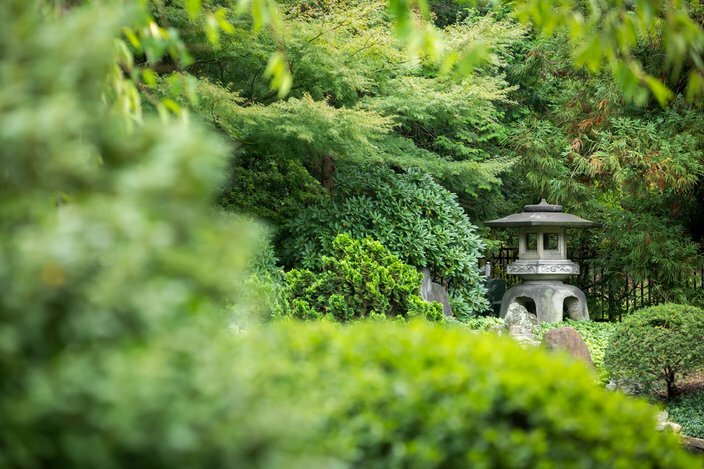 The Shofuso sits on a 1.2-acre landscape consisting of three traditional Japanese gardens; a hill-and-pond style, a 17th-Century urban garden, and a tea house garden. Ken Ichiwara cuts away a lower-section of the roof that needs to be repaired. 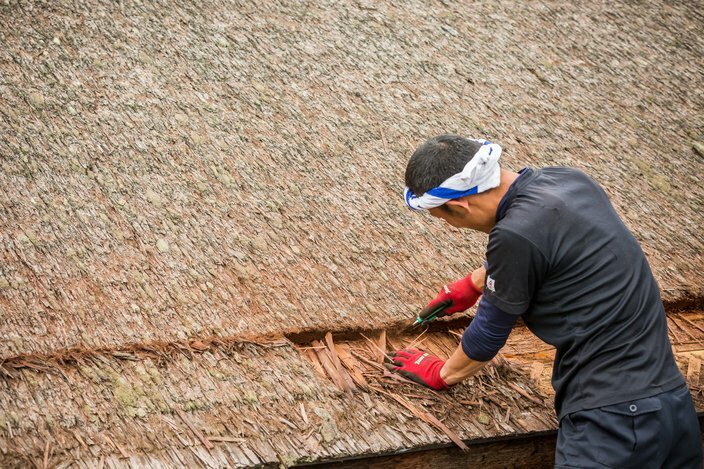 He used a traditional nokogiri saw, razors, and a pry bar to remove the old pieces of roofing material. The nokogiri saw used to initially cut away the damaged roofing material. This saw cuts on the pull stroke, as opposed to the Western-style saws that cut on the push stroke. 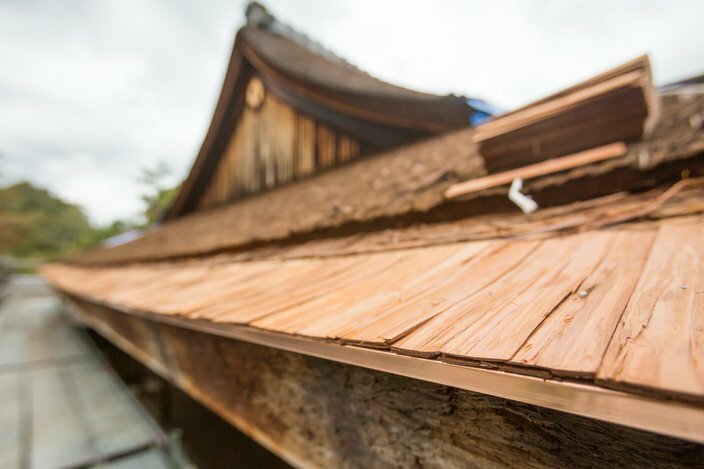 Once the old material has been cut away, Ichiwara pries away dozens of layers of bark, collects the pieces, and disposes of them. Once an edge and copper flashing have been added, single layers of bark, one-by-one, are placed the edge of the roof. This is done completely by hand, working from left to right. 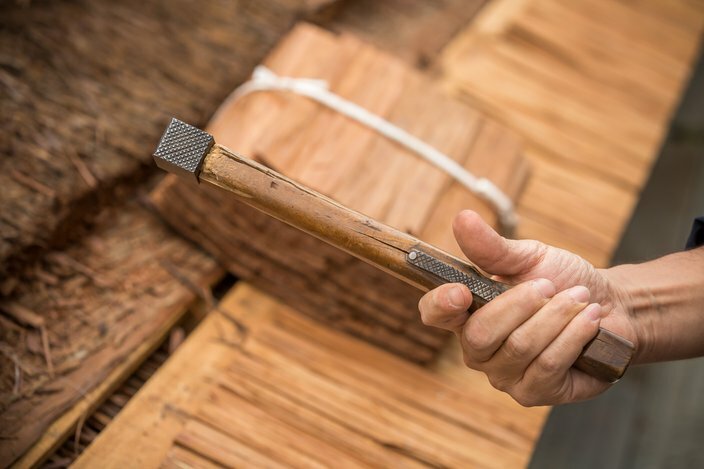 Kawada carefully aligns the Hinoki bark, using stainless-steel nails on the first layers. Kawada uses a Japanese roofing hammer that was custom-made to fit his hand. 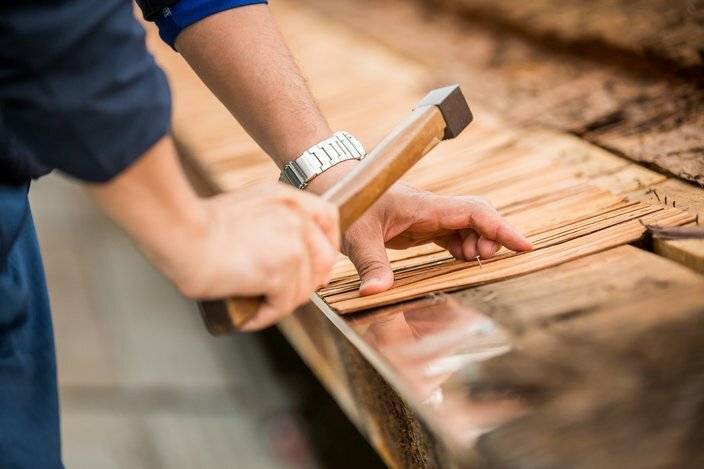 There are spiraled finger grooves on one side, a 4-sided square head, and a nail-starting plate near his index finger used to initially start the nail before it is completely nailed in. By keeping a small handful of nails in his mouth for quick access, he is able to work extremely fast while maintaining precision. Kawada meticulously shapes and places the pieces needed to adjoin to the existing sections of the roof. The tools needed for this type of work seem simple and basic, but the skills required to do the job have only been learned by around 100 people worldwide. Repairs to the roof were delayed when the raw materials were held up in customs. The bark needs to be fumigated before it leaves Japan to kill the potentially-invasive insects that might try to come along for the trip. 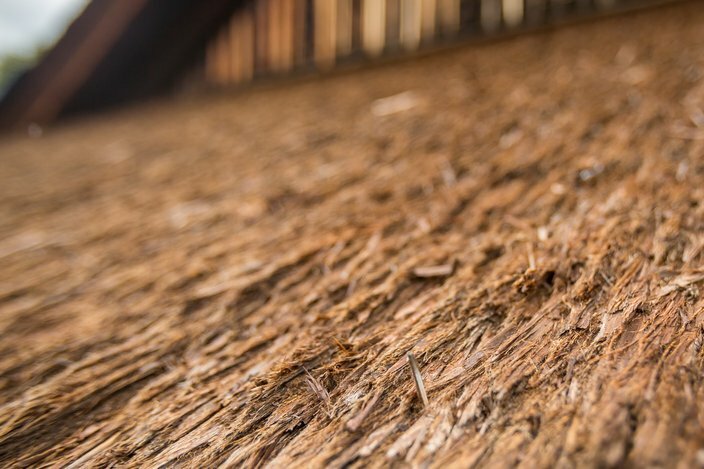 For the final layers of bark, bamboo nails are used, in the traditional style, since they do not rust or oxidize.